It has 2 way audio so you can also speak to people at your door without being at home or if you are at home you don’t have to open the door to talk to them. It comes in 3 different styles of light fixture to meet your home decor and taste – craftsman, traditional and contemporary. Most criminals force their entry through the front door, this followed by the back door as the most common way to gain entry. Covering these points of entry makes sense – it gives you the opportunity to deter the criminal before anything happens – preventing damage and loss. I think the lights look great and putting the camera in them in is an innovative idea. On first look there are concerns about how the camera will work when the light is on and whether the camera viewing angle and whether you can point it far enough over to get a good look at the door to see who is there clearly. Then there are the normal things about what happens when there is an internet outage, video quality and where is the video stored to think about too, when assessing it’s usability for security purposes. It’s great to have something that looks good and doesn’t detract or maybe even adds to the look of your house but it does need to perform as a security camera first. In my review I look at all these factors and more. It is designed to replace your existing external door or porch lights (on walls not the ceiling) with the mounting hardware included to help in the process. It can be installed in 30 minutes. It comes with a holding hook that you can use to hold the lantern so you can use both hand to attach the wiring. it makes this part of the job much easier and means it can be done easily by one person rather than having to try and hold it under your arm on tip toes or some other difficult to impossible way of holding while you wire it up to the house supply. If you can it is a good idea to install it so the power is on constantly so it isn’t turned off by mistake which could lead to you missing critical events when the camera is off. You can control the light by setting a schedule or manually switching on/off with the App. You can install as many cameras as you want at your home to cover all the doors and entry points. To complete the installation you’ll need a Phillips screwdriver, a step ladder and silicone sealant (not required but good for sealing against the weather). You also need to supply a standard A-15 light bulb 60 W, LED or CFL bulbs. Also required is strong WiFi signal where it is being installed using 2.4 GHZ 802.11 b/g, IOS 7.0 (at least iphone 4S) or Android Device 4.3 (and above), the free App downloaded and Bluetooth 4.0. The actual set up only takes minutes after you’ve downloaded the App to your phone. There is no need to plug it into your router as the set up is done using Bluetooth on your phone. There is no contract to be signed to use the camera. They do have some premium plans that you have pay monthly or annually for but you don’t have to do this to use the camera. Without subscribing to these plans you can watch as much live stream video as you want plus you get the two-way intercom, notifications and light scheduling. You also can review video from the last 2 hours and download a maximum of 3 videos a month. Plus you get the smart detection – where the camera records 10 – 15 seconds before the event and form 10 – 15 seconds after so you see what caused the event for a total of 2 minutes. It also includes a 14 day trial subscription of the absolute control plan. If you don’t subscribe to plan at the end of the period it reverts back to the no fee situation and any video recorded over 2 hours ago is deleted. Absolute Control – $29.99 per month, stores up to 30 days of events. You can download as many of your event videos as you want. It covers up to 8 cameras. (15% discount off future devices). You can subscribe annually to receive a 33% discount. If you choose to cancel the subscription annual or monthly you are refunded the unused portion. There are no penalties. At present the only way to contact the company is via email. They do seem to be keen to respond to emails in the most part. They will contact by phone to work through issues you may have with your light. When I contacted them for information to complete this review they responded the next working day. Their responses were thorough. The company offers a 30 day money back return policy and a 1 year warranty on the parts. The camera has 720p HD resolution with a 116 degree angle view. This gives it a good angle for capturing what is happening outside your door. It is a fixed view so can’t be pan/tilt or zoom with the app. It is possible to zoom in on the recording after you’ve downloaded from the cloud. The images quality is in full color and is clear during the day with you able to see what is happening clearly outside your home. To see a face clearly it is best up to 8 ft from camera. For use at night it doesn’t have night vision (IR) but uses the light from the lamp to illuminate the area so the camera can see what is happening. This gives a full color picture but it can appear to be washed out with the light source above the camera “bleeding” in from the top but are still usable. At about 8 feet the images start to become blurry. The best results are seen when using standard A-15 LED or CFL light bulb which reduces the washed out feel but not completely. There is also a small guard that you put on top of the camera to reduce this. Having the camera looking down reduces this effect too. The two way intercom works well enough that both parties can understand each other. There can be a little delay when using away from home dependent on the connection. You can adjust the camera lens angle to get the best view of the area you are monitoring as it is often going to be the side and above the area as it is replacing your porch lights. You have the ability to move it side to side and up/down up to 40 degrees – the motion detection moves with it. This should be enough for most installations, along with the 116 degree field of vision, to get a good look at anyone coming to your door. All the recordings (the length of time you can go back and see depends on your plan) can be accessed using the App under the recordings menu, where you just tap on the camera and the event you want to watch. You can’t store video locally or to your own storage online in the first instance – it needs to be stored on the company’s cloud services. You do have the ability to download video from the cloud. The paid options give you unlimited downloads but you only get 3 per month with the free option. Only one side of the conversation is recorded – the person at the door is all you’ll hear it doesn’t record the person speaking through the App. To protect your recordings and data they company uses 128-bit AES encryption and SSL bank level encryption. The recording direct to a cloud does have the advantage in that it can’t be lost as a result of theft or fire etc. However, it does tie you to the company payment plans if you want more than 2 hours to view your recordings. If you miss the alert or can’t check your phone for over 2 hours you may miss a security event and lose the ability to watch the video and save it to help the police with their investigation. The light has a built in siren that is 100 db loud (like a jackhammer). It can be triggered from your phone – it is loud enough to deter most criminals as they are concerned about the possible attention it might bring and move on to another target. Your neighbors may ignore the siren but it should bring your home to the attention of anyone on the street and it is this possibility that may well prevent the burglary. It won’t sound on the detection of motion as it is not set up to detect someone forcing entry, so does need you to manually sound it – although that can be from anywhere you are at the time. You have a few options about receiving alerts. You can turn them on/off globally or set them on a timer as to when you don’t want to receive them on your phone. Or if you have more than one camera you can set them by camera – so if you want alerts just for the front door but not for other entrances this is easy to set up. To receive a notification you need to be logged into your App (it doesn’t need to be opened) and it will chime when you receive it. Once you receive the notification of an event you can open it up and start viewing the recording. You receive one notification per event that lasts about 2 minutes. If you have more than one camera you’ll receive a notification from all camera that detect motion but won’t receive another one for another 2 minutes as they continue record the event. If motion continues after that time you’ll receive another alert immediately. All monitoring and control of the camera is done using the mobile phone and can be done from anywhere you have a signal to your phone. It is a basic App but is fairly easy to use . It is easy to share access with others to get notifications and monitor the camera. The person you are sharing does have to sign up for their own account first. You then share access by typing the persons email into your account. Notification preferences are set by each individual account so they can decide whether they want notifications or not. You can remove access of anyone to your Kuna by deleting their email from that camera’s settings. The owner is the only person who can add and delete people to/from the camera. There is no limit to the number of cameras you can install at your home to cover all the major entry points. As well as monitoring your home you can monitor other premises from the App providing they have WiFi such as a vacation home or business premises. For the most part you get notification and load the live feed quickly enough to see the person at the door not after they’ve gone but it does depend on your WifI and you phone’s connection to the internet. Only one person can view the live feed at one time. To access the live feed of a camera you have to click on the camera thumbnail, you can’t see all cameras at once and have to toggle to view and interact with people over the intercom. While viewing the live feed all the cameras (including the one you are viewing) continue to detect and record motion events. There are no batteries required nor is there a power backup. It is hardwired to your house supply like any other light. If it is wired with an on/off switch this does need to be switched on otherwise it won’t work. The motion detection is set to pick people up to 10 feet away which should be sufficient for more entry points to send a notification to your phone. It uses a mixture of passive infra red and learning algorithm to identify motion you need to be alerted to. The field of view is the same as the camera (116 degrees) and moves as you position the camera. When motion is detected you can select the length of time the light comes on for. The defaults are 30 seconds or 5 minutes but it can be set for up to 60 minutes. To reduce the number of false alerts it is possible to alter the motion detection sensitivity by using a slider in the App under the camera settings. Getting the setting right is by trial and error to get it so it ignores pets or cars but still picks up humans. There is also the ability to tell it that it got wrong you tap the label Person, Not a Person in the App and it sends an anonymous message to Kuna’s servers for use in updating the App. When you leave your home the motion detector will detect the motion and it will send an alert to your phone it doesn’t have this scenario built-in yet. This seems a small issue to me but some people are have an issue with it. It doesn’t come with any geo-fencing or something similar to know not to record or notify based on the phone’s location. The camera is always on (except if you turn it on/off at the wall) but you can turn the light on/off in a number of ways. You can manually do it through the App at anytime. You can set dawn/dusk scheduling where you can have the light set to do different things after these times. You do need to enter in your location – this can be your address, city or within 100 miles of your location. This helps the system know when it is dusk/dawn at the cameras location. You can have it so the light turns on at dusk but turns off later to save energy at 10 pm. You can also use an offset time so that lights turn on/off 1 hour before or 1 hour after dusk and/or dawn. You can also set it to have the lights to come on when motion is detected either at night or always or not at all. If you do set the lights to come on at motion at night the first 15 seconds of the recording is going to be dark to black as recording starts 15 seconds before the motion is detected. The way to avoid this is to set the lights to be on at night time or have another way of having the area to be illuminated. The lamp itself is made from aluminum coated with plastic but the fitting is plastic to allow WiFi signal to get through. Just below the end of the lamp is the camera lens and the motion sensor. Just above the lens is a shade that can be used to stop some of the washed out effect from the light bulb that can happen. It includes the speaker and microphone for the intercom. Underneath the fitting is the LED status light. The LED status light can be turned off so that the camera is not brought to the attention of the person at your door. It does mean a person doesn’t know they’re being filmed or watched as they are less likely to notice it but it doesn’t then act as a deterrent and they may continue on with the act of break the door or stealing your delivery. It does depend on what your goal is. You can always speak to them or sound the siren. It also means its less likely to get ripped off the wall as they won’t see it there. If the camera disconnects from the WiFi or there is a power outage it stops working. You receive a notification to your phone when this happens. It will reconnect automatically when the connection or power is restored. At present if the company servers go down so too does the camera and the lights. You aren’t notified of the issue, leaving you without coverage and also in the dark (figuratively and literally). It does seem this is less of a problem than it was with their being less concerns being expressed in customer reviews. Also when you wire it up and connect it to a switch you will miss anything if it is turned off by mistake. If the light is stolen it will be replaced if you have subscribed it into one of the payment plans but not if you are on the free plan. It should work at your door where you have at least 2 bars of signal showing on your smart phone. The signal can be boosted by buying an extender or repeater that works with your router. The camera communicates wirelessly using your WiFi with internet and on through to your phone. However, it does need to be hardwired to your house supply for power. It doesn’t come with zones in the traditional sense but you can set each light up separately as to whether they record on motion or send an alert when motion is detected. This can help you to manage costs too as some can be on the free service while others are on the paid subscription. You can buy matching lanterns for each of the Kuna that don’t have a camera or intercom, but allow you to have a matching pair at your front door etc. They pair up with the camera lights so that they can turn on and off together. At present the cameras don’t work with other smart home devices. The company do say they are working to have it working with other devices. It would be good to have ii working with motion sensor lights as the camera doesn’t have night vision. It uses the light in lamp to light up the porch area. It also lets you keep an eye on the day to day comings and goings of people to your door and front yard (or other areas depending on installation) – which can provide you with some surprises as to who is around when you’re not there! Plus it can help you to keep an eye on Amazon packages left at your front door. It can give you the chance to scare away anyone looking to steal them. It can also be helpful in getting rid of people coming to your door trying to sell you something. You can deal with them without having to open the door from inside your home or from anywhere else for that matter. It overcomes that problem you have when at home where you’re stuck because you’ve opened the door. Or Now you can just ignore them altogether once you’ve seen who is there. In most cases installation is straightforward with it fitting with most existing external light fittings. As with all these start companies you are helping them fix their bugs which is not for everyone. As you go through the customer reviews on the whole the system has had a few problems as seems to be the norm with first generation smart home and security systems. Companies do seem to release them without them being fully tested using the customer to some of the testing on their behalf. One of the issues is the price of the video storage and that you don’t have the option of storing the video locally. To get more than 2 hours of storage you need to pay $4.99 per month which they think is expensive. Other issues can be the time it takes to connect to the camera means that you can miss who is at the front door even with a strong WiFi signal, and it dropping out. Neither of these should happen and the company does respond to work with the customer to resolve. Having said that, the majority of customers have had a good experience with the light and some have bought additional lights/cameras. There are two aspects to this – the light price and subscription cost. When comparing this to other entry cameras it is a similar price – like the Ring video Doorbell – although that is also doorbell it doesn’t have a motion/smart light or smart detection. The storage cost of the Ring Video Doorbell is $3 a month or $30 annual for up to 6 months storage of video which is more economical than the Kuna pricing starting at $4.99 per month for 7 days storage (there is a free option). However, there are discounts for more than 3 cameras (Ring doesn’t have a discount plan). The pricing plan is similar to the Nest Cam. Criminals normally target the front door first then the back door to gain entry – one will give you coverage of the main entry point and 2 would give you the coverage to cover where the majority of break in attempts are made. 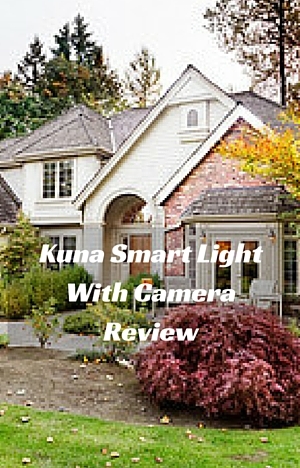 The Kuna Smart Light With Camera has some good features. It is good for seeing what is happening at your door when you are away from home and when you’re there too. It can help in protecting your home when you aren’t there by detecting people trying the door and sending you an alert. You can then sort an issue before it becomes a problem. You do have to pay for more than up to the last 2 hours of storage of video. Also night time video can be washed out and blurry (depending on lighting) but most burglaries do happen during the day. It is also a new product so there are bugs and it is still being developed. If you are prepared for some frustration this can be a great tool (alongside a DIY home security system) to protect your home and to keep an eye on your entrances and deal with people remotely.